A few preservatives, emollients, silicones (one particular, hard to remove even with strong detergents). Tea tree and mint extracts appear after fragrance, therefore their amount in the cosmetic is very low. The product is also enriched with a few useful ingredients, for example panthenol (provitamin B5). The overall impression of this composition is not that bad, however, it could be shortened by a half of the artificial ingredients. Organix ensures that this balm is an organic product, fee of sulfates. Use: Apply on damp hair, rinse after a few minutes. Purpose: All hair types that need nourishing and hydrating. 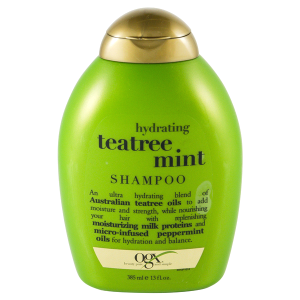 Organix Hydrating Tea tree Mint Conditioner hair balm can be classified as an effective product, however, not surprisingly good. Taking into consideration its low price, the product works well. It is easily distributed all over hair and is really lightweight. Thanks to this feature, it does not weigh hair down. After a few days of use, an increase in hydration, refreshment, nutrition and delicacy is visible. However, the product left on hair for too long can cause irritation and itching. Among many reviews of the balm we can also encounter a repeating issue of tangling long hair. Furthermore, it has a beautiful scent. Thanks to the mint extract it gains a refreshing feature. Therefore Organix conditioner works well during hot days, it is refreshing and gives cooling effects on the skin.